my name is Jens and i´m from Germany. I´m glade to be in this forum, thanks. I will show you my lastest build. I´m a real fan of the Toyota LC80 and most i like the petrol versions. here are some pics of my interpretation with the US-Version in 1.9 as hardbody. The Chassis is build by myselfe. he is laser cuted and powdercoted. Material is 8mm steel to have it havy as possible. The interieur baseplate is build out nearly 100 pices! and is under custruction. Also the badges are still missing. Really nice, thats coming along really great so far. Nice stance. This is the first one of these bodies i've seen used that hasn't been cut to pieces. That's because most of us are crazy! Welcome to the SBG Jens, that's a fine looking build. Your interior shell is very nicely put together, and your paint work is stellar! How did you get it so smooth?! I look forward to seeing more from you. Wonderful start you have there. Good to see such a high level of detail. thank you so much for your welcome and that you like him. Next is to put in the led´s that he gets the original us-style lights all around. then i paint the underneth of the intereur and start to create the inside of him. 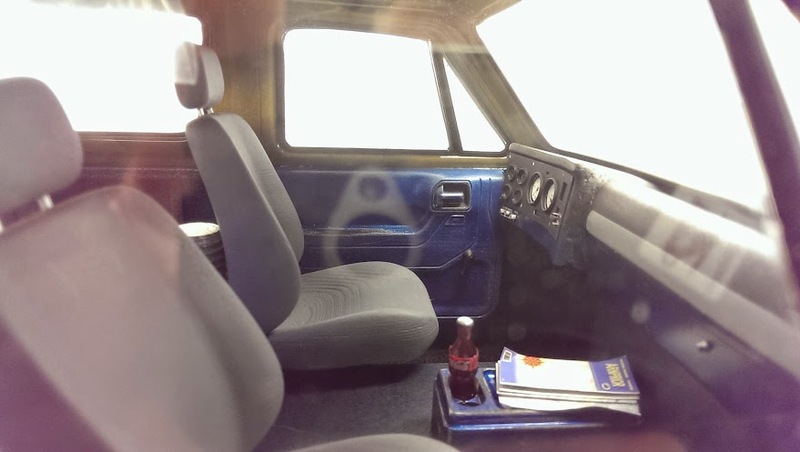 I saw in a verry cool build of the Ascender so cool frontseats maybe from an canadian?? but i can´t find them to get them !!!!!!!!!!!! For the outside comes rearmudflaps and the badges, thats all i gues. The body is painted by an carpainter in original Toyota light gold 4K1 1989 up to 1994. All details are paintet by my self, for the bumpers i used tamiya gunmetall with clearcot. At the chassis i lost a bit of travelway when i build in the dinky cantilevers, but it looks so stock, i had to put it in. On the body i mod the reargate, the stepbords, the wipers for an LHD and sand him so smoth i can. Also i double the doorhandels for better look after paint. yes thats the once i mean, but on his side i couldn´t find them to buy. Your build and the other one of your frind too are so cooooool! !